Winter holidays: the nights are long and dark, the days chilly and short. The same seven songs play, looped, in retail outlets and dentists’ offices. People have traditions and habits, travel and ritual and, perhaps above all else, food. Friends bake yam and marshmallow casseroles or dishes made with cream-of-mumble soup, topped with fried onions. There’s ribbon candy, Special Punch of one sort or another, fudge. 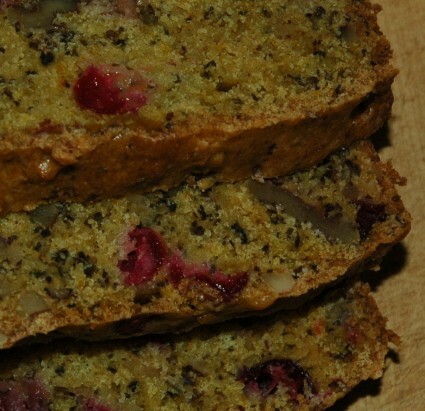 In your house the holidays brought one constant, always capitalized, dish: Grandma’s Cranberry Bread. Mom would slice it just so, put it in the toaster oven and melt a bit of butter on top. 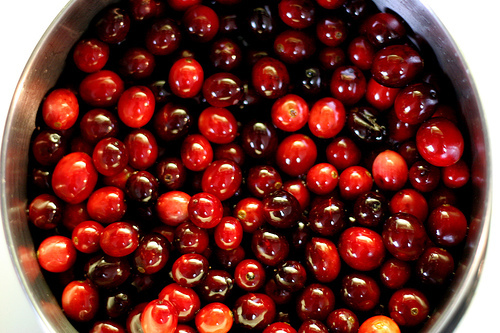 If you’re home during Cranberry Bread season, she still does this. It’s still delicious. This week you again dig out your recipe, smile at your first-year chemistry shorthand. (A quarter teaspoon “NaCl”, you say? How clever!) You’ve been carrying around this 3×5 card since college; it’s crumpled and torn and you squint to find out exactly what that number is next to “c flour.” (Answer: 2). The resulting loaf is true to memory: sharp citrus and cranberry with rich bites of walnut, delicate in crumb. It pairs well with a Puritan cup of black coffee – or even better with your favorite butter on top. Combine almond milk, water, and flaxseed meal in small bowl, beating vigorously for 30 seconds; set on top of stove near oven vent. Preheat oven to 350F. Combine flour, baking powder, baking soda, and sea salt; set aside. Return to flaxseed mixture; beat for 30 seconds and set aside. Peel orange and dice peel. Juice orange and add juice to orange peel. Add 2 tablespoons of oil to orange mixture, and blend in sugar. (Total volume should be about 3/4 cup.) Return to flaxseed mixture; beat for 30 seconds and then combine with orange mixture. Add this to dry ingredients. Gently fold in cranberries and walnuts. Transfer dough to greased loaf pan; bake at 350F for about an hour. Bread is done when it passes toothpick test; cool on rack before removing from pan. Allow to cool before slicing. Substitute up to 1/2 cup almond meal for some of the flour. For a sweeter bread, use brown sugar, or substitute up to 1/3 cup agave syrup. Add fresh-grated ginger or lemon peel to taste, and/or nutmeg and cinnamon. I use half whole-wheat pastry flour; you could also substitute a gluten-free flour blend. The original recipe uses one egg instead of almond milk/water/flaxseed meal mixture, which should sit for at least 10 minutes to let the flaxseeds bind with the liquid.